Julius system – planet Julius Secundum – Containment protocol in effect. Planet Julius Secundum disappeared from galactic maps. Small rebel cell was active on Julius Secundum when containment protocol was activated. Enforcer force found intel about rebel communication equipment in nearby sector. Patrol force was dispatched to deactivate equipment, but encountered rebel force. 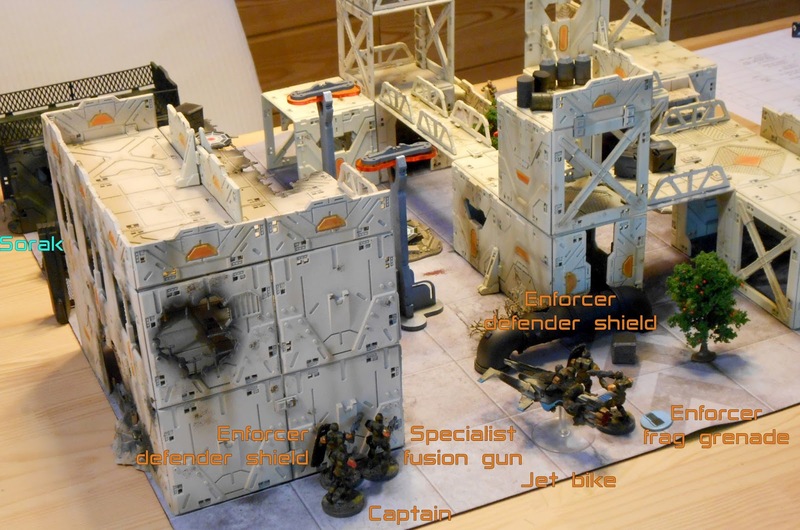 After winning initiative, Enforcer player let Rebel player deploy and play first. During scout move, rebel Yndij moved closer to leftmost objective point. Every Enforcer model is a threat, but Rebel player made decision to encounter biggest threat first – jet bike. Using command point he had moved his Specialist up the building and then opened fire on jet bike. The result was one wound on bike, which had returned fire, wounding and pinning rebel specialist. Sphyr loader had moved up the building and reloaded missile launcher from specialist. For his act he was rewarded with the bullets from enforcer captain that killed him right away. Enforcers received their first victory point. Rest of the turn passed in movement for both sides. Enforcers moved in two groups, every one protected by one Enforcer with shield. Yndij moved to control left most objective. Both rebel troopers moved through building closer to leftmost objective marker. Sorak moved toward Enforcers to get in range of his blaster. 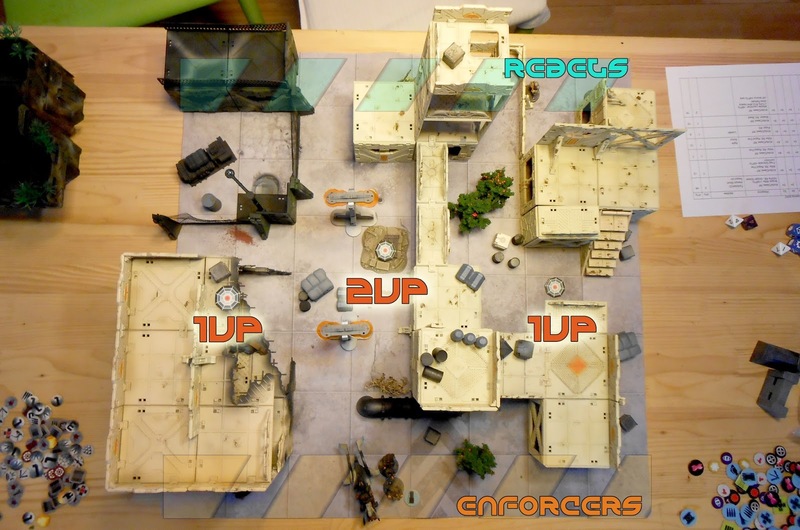 At the end of the turn rebel commander moved, using last command dice for movement, to the top floor of the tower, in preparation to encounter Enforcer commander and his group. At the beginning of the second turn Enforcer player brought his fusion gunner in range of rebel commander. Fusion gun didn't make any damage, but commander was thrown into the wall by the blast, suffering one wound and pining condition. 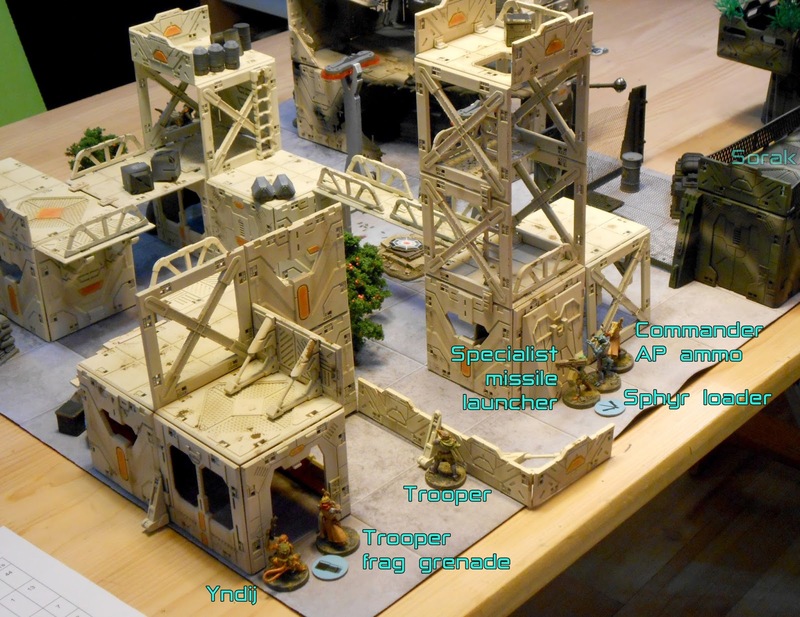 Sorak moved on the first floor of the building in front of him, and used command dice to fire on enforcer group with jet bike. Blast scattered enforcers around, leaving jet bike alone. Enforcers reacted by sending defender from captain group on overhang right above Sorak. With clean sight his shotgun delivered mortal blow to Sorak. After that he moved to control his leftmost objective point. Rebel specialist stood up and used command dice to fire on jet bike again. This time he succeeds in destroying it. Enforcer commander reacted by killing rebel specialist in return. Yndij moved one level up on the building and opened fire on Enforcer that was pinned and succeeded in wounding him. Enforcer defender returned fire and killed Yndij. 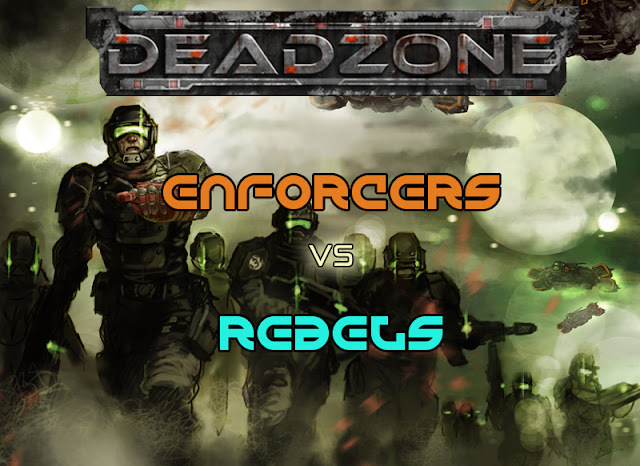 Death spree was completed by rebel commander who stood up and opened fire on Enforcer defender in control of objective killing him. One of rebel troopers moved to control objective, other picked up some items in vicinity. Turn three Enforcer player begun by firing again with his fusion gunner against rebel commander, with some extra command dices. Rebel commander used all of his extra command dices to resist damage and succeeded, but this time blast sent her down the tower, and she died from the fall. On the rebel left flank, some shots and frag grenades were exchanged between enforcers and rebel troopers, with only results of one pinned trooper on both sides. At the beginning of fourth turn rebels were in dire situation. Result was 8 to 5 for Enforcers. Only way to even result was for one trooper to kill enforcer commander. He used additional shot command dice, but did not succeed. It was time for rebels to withdraw. It was always a struggle for Rebel players against Enforcers, even in first edition (if you don’t use Teraton ). It is still. With cheap troops Rebel players always has numbers, which translate in playing second in first few turns. So it’s uphill battle, and it mostly depends of the dices, in my opinion. For the next battle, I will try some other army, or bring Teraton J.